One of the biggest objections to wearing body armor is comfort and mobility. Although the technology for stopping projectiles has improved over the last couple of decades, it’s come at a cost of breathability and all-day comfortable wear. The choice between being able to move freely during he pursuit of foes, and aid those incapacitated, keeping safe from bullets, flak, and other high energy projectiles, shouldn’t be one that law enforcement and first responders should have to make. For many years researchers, including physicists and chemists, have tried to bridge the gap between comfort and safety. Now, meet the new Ballistic Fabrics. Ballistic protection refers to a type of thin material, usually made out of synthetic polymers, that is capable of stopping a projectile bullet or stab from a sharp weapon. One such fabric is made of a structured polymer composite made of alternating rubbery and glassy layers. 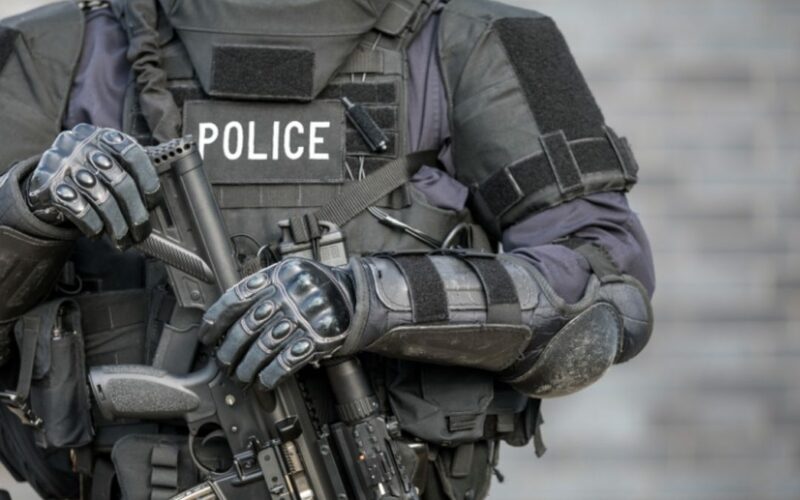 Other such fabrics are made of aromatic Nylon that while not completely impenetrable, is quite effective at stopping projectiles from penetrating the body armor. Who else needs material made from Ballistic fabrics? Law enforcement officers aren’t the only ones who benefit from flexible body armor. Soldiers can fashion flak-fatigues out of flexible ballistic fabric, instead of wearing tough shields underneath their uniforms or sheltering underneath cumbersome flak blankets. In hot, desert areas, ballistic fabric with sweat-wicking breathable properties would make the soldiers more comfortable. Creating an entire uniform out of this type of fabric, rather than just having blocky plastic strapped over sensitive areas, gives fighters a 360 level of protection and confidence. K-9 vests for service dogs are specifically designed for the range of movement for a dog, but using lightweight ballistic fabric is much more comfortable for the animal. The dogs are constantly in situations where they can be easily harmed. A lightweight vest allows the dog to remain agile instead of being bogged down. If a dog is chasing down a suspect or searching for drugs, they must be able to move quickly and remain agile. Should ambulance and fire first responders have ballistic fabric vests? First responders in a mass shooting or other disaster may also have need or protection from secondary explosions, or from falling debris during a crisis. In fact, Finland is now equipping its first responders with bullet-proof vests. Due to the nature of their jobs, with bending, twisting, lifting and squatting, vests made of ballistic fabrics which confirms to the body and moves with the wearer. As emergency personnel respond to calls of drug overdoses and erratic behavior from those under the influence, it’s very important that they are protected from a slash or stabs from the out-of-control patient. Although their duty is to save lives, emergency responders will have difficulty doing so if the patient themselves is a threat to the first responders. Those on duty in prisons are under a constant threat. Many lives have been saved with stab-proof vests; however, if there is an altercation in a prison, the offending inmate may not just threaten the protected area covered by a vest, but other places on the body, including limbs. With guard uniforms made from ballistic fabrics, the prison guard can confidently subdue threats and feel more secure in their ability to do their job. There are many uses for ballistic fabrics, protecting those who serve, as well as those who help to protect. Using a protective fabric that conforms to the wearer, is , sweat-wicking, breathable able, and is lightweight will help many in dangerous situations, not just police officers.